Kiwis are iconic symbols of New Zealand. These distinctive birds are easily recognizable by their long beaks, seemingly wingless bodies, strong legs, and brown plumage. The family (Apterygidae) first appeared during the early Miocene and there are five extant species. These remarkable birds are now in great danger and have been declining rapidly since European settlers arrived in the mid-19th century. 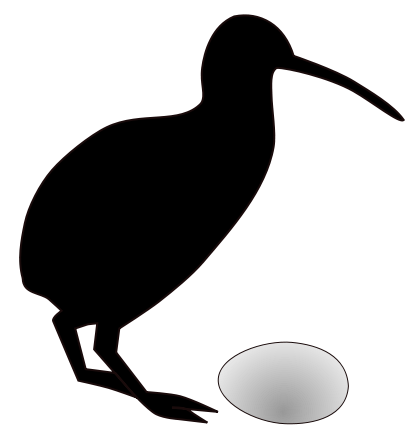 Relative to body size, kiwi lay the largest eggs of any bird. Because of this, it was long believed that kiwi descended from larger birds, presumably from moa: as the birds became smaller their eggs remained the same size. The discovery of the kiwi-like bird Proapterx micromeros of the middle Miocene (19-16mya) contradicts this theory, however. Discovered in April 2012 at St Bathans in New Zealand’s Central Otago, this bird was one-third the size of the smallest extant kiwi species alive today, weighing an estimated 234 to 377g in life. Rather than shrinking down from larger ancestor, it seems that kiwis actually increased in size over time from a smaller ancestor, a common trend among animals that have evolved on islands. 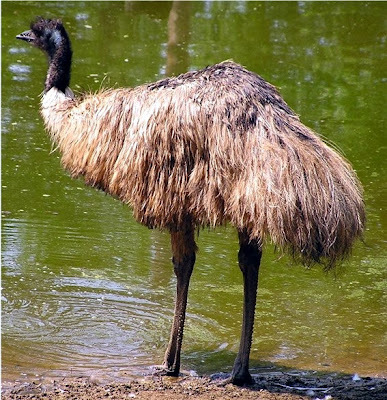 Furthermore, DNA evidence has suggested that the kiwis’ closest living relatives were the emus and cassowaries of Australia. 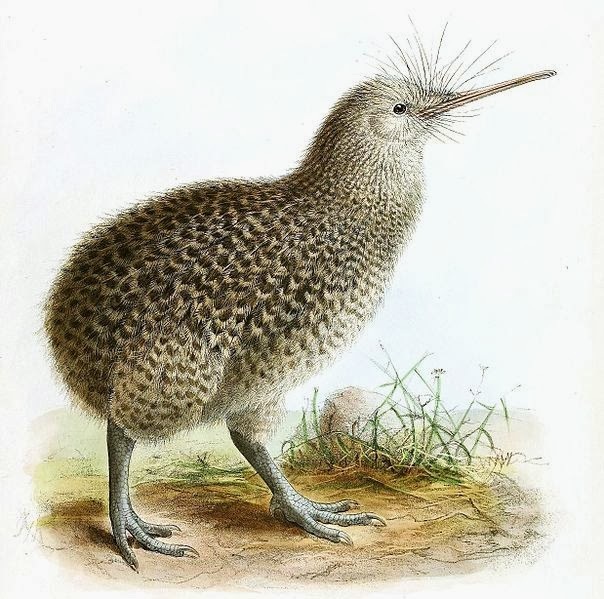 Whether Proapterx micromeros itself could fly is still uncertain, but kiwi seems to have originated from a basal dromaiid bird that was still capable of flight. The small Australian birds would have then flown to New Zealand during the early-middle Miocene. Many types of flying birds today still make the same journey between Australia and New Zealand. Having long since lost the ability to fly, the pectoralis muscles are highly atrophied and there is no sternum (breast bone). The wings themselves are so small that they are not visible beneath the bristly, hair-like feathers. The skeleton is heavier than those of flying birds, particularly around the legs and hips. The bones contain marrow unlike most flying birds. The beak is long, pliable, and sensitive to touch. The eyes are small, but the birds’ vision is keen enough for them to weave through obstacles when running through the undergrowth at night. Long vibrissae (whiskers) are present around the gape. The gizzard is weak and their cecum is long and narrow. Kiwi have a highly-developed sense of smell and are the only birds with nostrils at the end of their beaks. They feed mainly on small invertebrates, including insects and many varieties of worms. Ecologically, kiwi are New Zealand’s answer to various types of mammalian insectivores. Prey is located via smell. The birds actively search the undergrowth when hunting, probing the ground and checking tiny cracks and crevices with their long, thin beaks. Their sense of smell is acute enough to detect small animals hiding underground, within logs, or beneath the leaf litter. Food is picked up with the tip of the beak and then tossed to the back into the throat with quick jerks of the head (see video below). Secondary food items include fruits, seeds, small crayfish, eels, and amphibians. Kiwi form monogamous pairs that jointly defend a territory of 20-100ha (50-250acres) depending on the species. All kiwis emit a loud, high-pitched, repetitive call except for the female Brown Kiwi which has a rasping call. These vocalizations are used for long-distance communication. At close range the sense of smell becomes more important. In fact, kiwi have a rather strong and distinctive odor about them, which may be involved in olfactory communication. During the breeding season, which lasts from June to March, the pair call to each other at night and meet in a nesting burrow every 3 days. These relationships may last as long as 20yrs. They are unusual among birds in that, along with some raptors, they have a functional pair of ovaries whereas in most birds only the right ovary is functional. Kiwi eggs can weigh up to one-quarter the weight of the female, making them the largest egg relative to body size of any bird. The equivalent would be if humans were to give birth to babies weighing 11 to 19kg (25 to 40lbs)! A single egg about 6 times larger than that of a chicken is laid per season. The eggs are smooth in texture and are ivory or greenish-white in color. With the exception of the Great Spotted Kiwi, in which both parents take turns in incubation, the male takes on sole incubation duties. Incubation lasts 63 to 92 days depending on the species. Producing such a large egg exacts a heavy toll on the mother. For the 30 days it takes to grow the developing egg the female must eat 3 times her normal amount of food. During the final 2 or 3 days before the egg is laid there is little space left inside the female’s stomach and she is forced to fast. Newly hatched chicks are sustained by a yolk sac for the first week of their lives and are fully capable of feeding themselves thereafter. The largest species, known natively as the Roroa. It stands about 45cm (18in) high and weighs about 3.3kg (7.3lbs) for females and up to 2.4kg (5.3lbs) for males. They have gray-brown plumage with lighter bands. Both parents take part in incubation. The overall population is estimated at over 20,000, distributed through the more mountainous areas of New Zealand such as northwest Nelson, the northern West Coast, and the Southern Alps. In this rugged habitat, this species is relatively safer from introduced predators and its population is believed to be relatively stable. 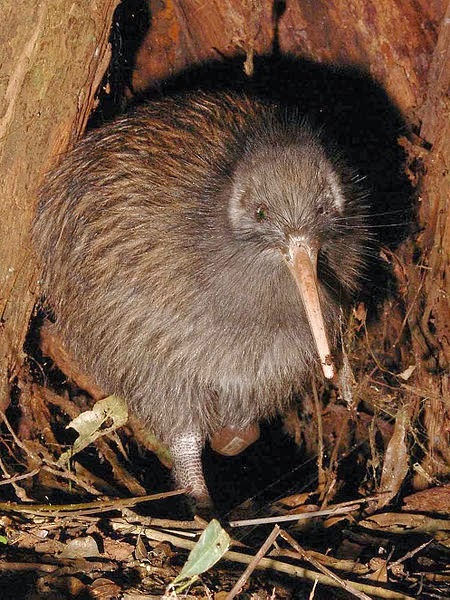 The smallest of the kiwis, this species stands about 25cm (9.8in) high and the female weighs up to 1.3kg (2.9lbs). Its inability to withstand predation by introduced animals such as dogs, cats, weasels, and pigs has led to its extinction on New Zealand’s main islands. About 1,350 remain on Kapiti Island and it has been introduced to other predator-free islands where they appear to be becoming established. The Okarito Kiwi is also known as the Rowi or Okarito Brown Kiwi. It was first identified as a new species in 1994. This is a smaller species with a greyish tinge to its plumage and it sometimes has white facial feathers. Females may lay up to 3 eggs in a single season in three different nests. The male and female share the incubation duties. 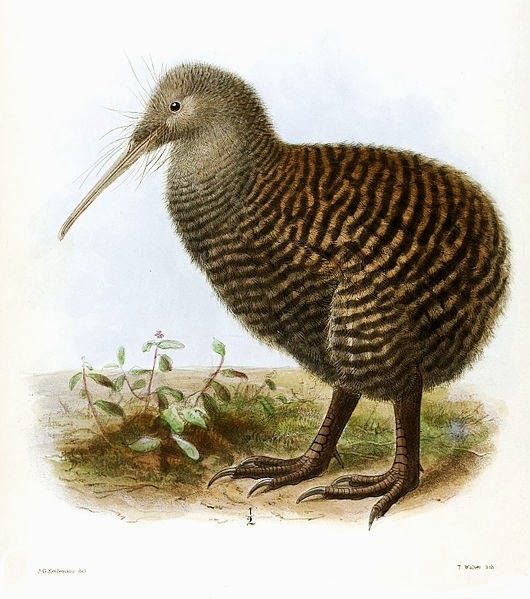 Before the arrival of man, this species was widely distributed up the west coast of South Island and it was also present on the southern half of North Island, where it was the only kiwi species known to have existed. Its current distribution is now limited to a small area on the west coast of South Island. The Southern Brown Kiwi is also known as the Tokoeka or Common Kiwi. It is a relatively common species known from the south and west parts of South Island where it occurs at most elevations. Before the arrival of humans, its range also included the east coast of South Island. It is around the same size of the Great Spotted Kiwi and is similar in appearance to the Okarito Kiwi, although it is lighter in color. Also known as the North Island Brown Kiwi, it is widespread in the northern two-thirds of North Island and is currently the most abundant kiwi species, with over 35,000 individuals remaining. Females stand about 40cm (16in) high and weigh about 2.8kg (6.2lbs), while males weigh about 2.2kg (4.9lbs). This species has demonstrated a remarkable resilience. It adapts to a wide range of habitats, even non-native forests and some farmland, surviving very well near human habitation. The plumage is streaky red-brown and spikey. It is the fastest-breeding of the kiwi with females usually lays two eggs per clutch and can produce two clutches a year. Eggs are incubated by the male. The kiwi has always been of great significance to the native peoples. The Maori have traditionally believed that kiwi were under the protection of Tane Mahuta, the god of the forest. They were used as food and their feathers were used in ceremonial cloaks called “kahu kiwi”. Kiwi feathers are still used today, however they are now gathered from birds that died naturally, through road accidents, predation, or from captive animals. They are no longer hunted and some Maori consider themselves their protectors. Today the birds have been adopted as the national symbol of New Zealand. 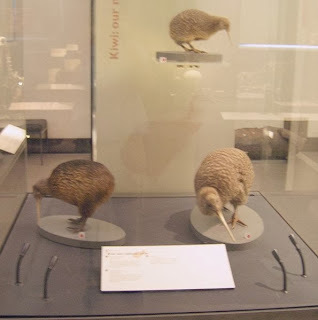 Since European settlers arrived in the mid-19th century kiwis have suffered greatly and all 5 species are threatened and they are declining at a rate of about 6% per year. About 1,000 years ago there were 12 million kiwis. By 1923 there were around 5 million. Finally by the 1990s, there were roughly 70,000 of them and this number continues to fall. The greatest threat to kiwis are introduced mammalian predators like weasels, dogs, and cats. Stoats are responsible for about half of chick deaths in many areas of New Zealand. Cats also prey on chicks, but to a lesser extent. Research has shown that the combined effects of introduced predators and other sources of mortality result in less than 5% of kiwi chicks survive to adulthood. Kiwi chicks remain vulnerable to Stoat predation until they reach 1 to 1.2kg in weight, at which point they can usually defend themselves. Ferrets and dogs often kill adult kiwi, and these can cause large and abrupt declines in populations. Dogs, in particular, find the strong and distinctive scent of kiwi irresistible and easy to track. Other threats include habitat loss and modification, as well as motor vehicle strikes where roads cross through their habitat. The now restricted distributions and small size of some kiwi populations has also increased their vulnerability to inbreeding. Poorly-set possum traps also maim or kill a large number of the birds every year. The following is a 7 minute video showing one of many conservation efforts underway to boost kiwi numbers. There are five species of kiwi birds all of which are native to New Zealand. They are also the national symbol for new Zealand. Here in his article, I will present Kiwi Bird Images Facts and its classification with photos. To name, or not to name, that is the question.